Dr. Dana Perkins is Senior Science Advisor with the Office of the Assistant Secretary for Preparedness and Response at the U.S. Department of Health and Human Services (HHS). In this key post, she provides subject matter expertise and technical advice on policy and planning issues related to biosafety and biosecurity impacting the nation. A microbiologist by training, Dana has a broad experience in science and policymaking including a wide range of security areas involving biological and chemical weapons. This includes working towards biological weapons nonproliferation; consequence management of biological incidents; biological threat assessment, lab and field detection of biological agents, and defense support to civilian authorities. Before her current position at HHS, she served in a U.S. Government-seconded position as a member of the Group of Experts supporting a subsidiary body of the United Nations (UN) Security Council known as the 1540 Committee. The 1540 Committee was established by the UN to monitor the implementation of binding legislation that all United Nations Member States were required to adopt to prevent the proliferation of nuclear, chemical and biological weapons, and the means of delivery of these weapons, and establish appropriate domestic controls over related materials to prevent their illicit trafficking. Dana was born in Transylvania and raised in the former communist country of Romania and humorously describes herself as an “American by choice and vampire by birth.” She also sees many parallels between the spread of vampirism and infectious diseases but she chose microbiology as a field of study not to dispel the myth of vampires (great-great-great grandpa Dracula may still enjoy his 15 minutes of fame) but to understand what makes germs tick and how can we treat the diseases they cause. 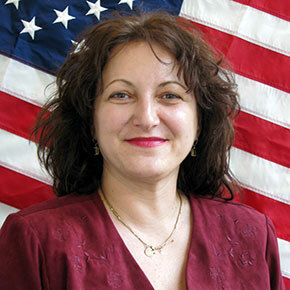 Dana went on to earn her Master’s degree in Biochemistry from the University of Bucharest, Romania and her Ph.D. in Pharmacology and Experimental Therapeutics from the University of Maryland, Baltimore, and soon received noted recognition for her scientific work. This included winning — while she was a Ph.D. student — the 2001 National Collegiate Inventors Competition (sponsored by the U.S. Patent and Trademark Office and the National Inventors Hall of Fame) for her invention of gene therapy for Alzheimer’s disease using a Herpes Simplex Virus Type 2 vector (US patent no.7,482,318). Historically, she adds, biological weapons programs pursued by countries such as the former Soviet Union as well as the anthrax attacks by mail of 2001 in the U.S., highlight the ever-present and clear danger of biological threats and challenges they may pose to our national security and our ability to respond effectively to protect public health. She also currently serves as a Major (a CBRN Science and Civil Affairs Officer) with the US Army Reserves 20th CBRNE Command in Aberdeen Proving Ground, MD. In addition, Dana is author of Crossword Puzzles for the Microbiology Savvy –– a popular book which tests both the expert and non-expert on such microbiology subjects as bioterrorism, biodefense, medical microbiology, and famous scientists/discoveries in Microbiology.